Don't Miss the Chance to Hang with Brad Evans at Urbane! It doesn’t matter if you are a Sounders fan or a foodie; the “Cook with a Sounder” contest is something that you will definitely want to enter. I repeat. Do. Not. Miss. This. Contest. Enter the “Cook with a Sounder” contest immediately. Here are the contest details: The Seattle Sounders have teamed up with Urbane restaurant in downtown Seattle for the amazing “Cook with a Sounder” contest; four lucky winners and their guests will receive a cooking lesson meal prepared by Urbane’s Executive Chef Greg Lopez and Seattle Sounders FC player Brad Evans on August 19, 2012. If you’re at all confused for any reason about why you should enter this contest, read on. There are quite a few reasons why you, as an urbane Seattlite, might want to win an evening cooking with Brad Evans and Urbane’s Executive Chef Greg Lopez. First of all, Urbane is noted for bringing the best of Northwest cuisine to its tables and only serves northwest wines. Urbane is located in the Hyatt at Olive 8. Urbane is chic, hip, absolutely fab and is reported to have some of the best northwest cuisine in Seattle. Having the chance to share an evening with Urbane’s Executive Chef is reason enough. 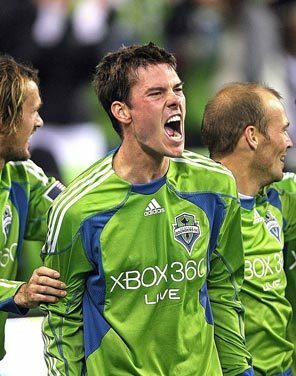 Second of all, Seattle Sounder Brad Evans has been a member of the Sounders FC since 2009 and was featured in Seventeen magazine as one of the “Guys Next Door in Soccer Gallery” for his clean cut looks and winning smile. He’s not only a great soccer player, he’s incredibly good looking. Third, if you get Brad Evans drunk, you might be able to get all of the latest dirt and gossip about the Seattle Sounders. And fourth, if you get Brad Evans drunk, you might be able to….wait, scratch that. I’m pretty sure that I read that Brad Evans is taken, which is a sad state of affairs for all the young ladies, cougars, and men who think that Brad Evans is a rather attractive specimen. All in all, winning this contest is a huge win for whoever wins it. You could even that winning the contest would be a huge score….ha, ha. Here are the nitty-gritty details about the contest. Don’t forget to enter. Seattle is #16 on Forbes' ''Best Places For Business and Careers"
Come to Seattle and Leave Your Wallet at the Door!